I spent most of the day watching my daughter's club volleyball team play against a variety of other teams, all very good, at Clovis High School outside Fresno in the Central Valley. At the conclusion around 4p, I bade goodbye to wife and daughter and set out for a few days of extra peak bagging in the area. The Sierra foothills east of Fresno are home to a dozen P1Ks that I had yet to visit. With fine Spring weather and the hills as green as they ever get, it seemed a good time to pay them a visit. Most all of them are on private ranch lands, so visiting would require some stealth. I had spent time studying maps and satellite views ahead of time which paid off nicely. A shorter approach is from the southeast off Seminole Rd where one can hike a good dirt road nearly to the summit, but this involves bypassing at least one occupied home. A longer, but more secluded route can be found off Tollhouse Rd from the northwest, and it was this route I followed. A little-used road starts up from Tollhouse through a large meadow where it meets a powerline road, also little-used, running NE-SW. I found a few friendly cattle grazing under one of the transmission towers as I followed the powerline road southwest to a low saddle. Here I picked up an old jeep trail that climbs a ridgeline leading to the summit of Green Mtn. The route crosses several property boundaries, but the entire route is secluded and well out of sight, making me comfortable climbing it in the daylight. It's a delightful route climbing through oak forest and grassy slopes with many flowers in bloom. On the shadier north side of the ridge I would find poison oak and newts, making me wary where I stepped. I found the decomposing remains of a skunk, reminding me I would have to look out for these critters during the night later. I spent just under an hour hiking about two miles to the rounded summit. Through the trees one can see the snowy summits of the Sierra northeast to the Kaiser Wilderness. To the southeast lay the tranquil Watts Valley, very green, and to the northwest was the nearby P1K, Bear Mtn. I descended back down via the same path as the sun was setting after 7p, watching the last rays of sunlight filter with vibrant color through the trees and bouncing brightly off the yellow flowers along the route. Upon reaching the car I put my warm jug of shower water in my empty cooler for use later in the evening. There were more peaks to visit before the day was through. I had tried to reach Black Mountain first upon leaving Clovis, thinking I could drive most, or all the way up Black Mtn Rd found on the north side. But this proved an unworkable solution though promising at first. I drove several miles up the gravel/dirt road past numerous homesteads that line either side of the road. Unexpectedly, I came upon a locked gate marking a private nature preserve. I would have simply parked and walked the remaining distance except that one, there was no place to park nearby, and secondly there were dogs on either side of the road barking incesssantly behind fences. It would have been maddening to have to walk the road past these protective animals, all the while wondering when the owners would come out and ask what I was doing there. So I gave up on it and went to Green Mtn. While I was on Green Mtn I noticed the SW Ridge of Bear Mtn, though steep, looked like it might offer a mostly brush-free route to the summit, or at least as much as I could make out from about a mile away. It seemed worth a shot, and though there were homes nearby, the coming twilight would offer some cover from detection. I repositioned the van further north on Tollhouse Rd, found a small turnout and started up the slope north of the road. It was a fine route that I enjoyed a good deal - just enough nighttime bushwhacking to make it challenging without discouraging. 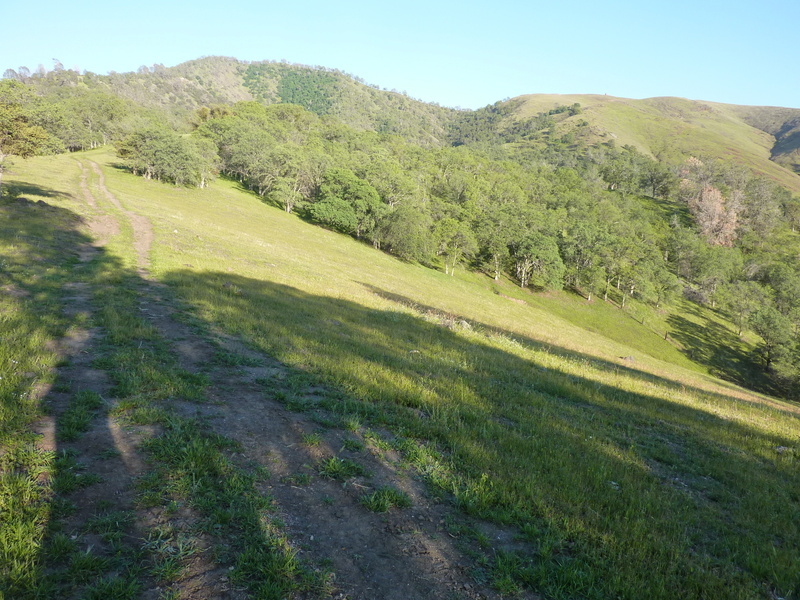 I came across some helpful cow trails along the ridgeline (and a few surprised cattle, too) to make things easier, though there were still plenty of obstacles. These included the ubiquitous poison oak, more slow moving newts, some rather steep slopes in places, and sections of brush that had me wandering about like a drunken sailor looking for a way through - all good fun. Near the summit I found what looked like the remains of an old trail sign that may have said, "Ridge Trail". I wondered if this was from the private nature preserve I had encountered earlier, perhaps a relic from a time when the public, or at least visitors, were welcome. The summit is now home to a collection of communication towers that are visible from a distance. Atop the highpoint sits the closed USFS lookout which I reached about 9:20p after almost an hour and a half's effort. I climbed the steps to the viewing catwalk around the shuttered cab where I took in the lights of Fresno and its surrounding ecosystem. It was a bit chilly up there, so I hurried down after taking a photo. The return was via the same route, getting me back around 10:30p. I should have called it a night at this point, but alas, I was too into the game and too high on Powerade to call it quits just yet.